What happened next after the Royal Wedding? Perhaps one of the most memorable moments, other than of course the two kisses on the balcony of Buckingham palace, was watching Prince William driving Kate Middleton from Buckingham Palace to Clarence House in a classic Aston Martin convertible. The short drive took place yesterday after the afternoon wedding reception for 650 guests at Buckingham Palace with balloons tied to the back and 'JU5T WED' written on the rear number plate, the car drew cheers and laughter from the thousands of well-wishers at the palace gates. The couple later returned to Buckingham Palace for the evening celebration which was smaller with some 300 guests, mainly consisting of family and friends. 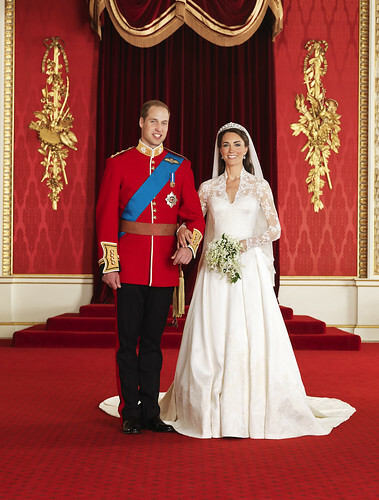 Kate Middleton, now the The Duchess of Cambridge had changed out of her wedding dress into a white evening dress by the same designer, Sarah Burton at Alexander McQueen. It is at this evening celebration that Prince Harry gave his Best Man speech and the guests celebrated into the early hours of this morning. Kate is reported to have said "I am glad the weather held off. We had a great day." Around one million people lined the streets in Central London to celebrate the Royal Wedding and some five hundred thousand people were around The Mall to see the couple come out onto the balcony of Buckingham Palace. Police have thanked the British public for helping to make the Royal Wedding security operation "an amazing success". There were only 55 people arrested. The alleged offences included breach of the peace, drunk and disorderly, handling stolen goods and possession of an offensive weapon. The security operation cost an estimated £20m under the threat from terrorists, stalkers and anarchists and thankfully the day was a success without any major incidents. The photo on the right is part of new collection of photos released today by Clarence House and the photos were taken yesterday at Buckingham Palace. The Newlyweds William and Kate spent the night at Buckingham palace and they left by helicopter this morning after taking a stroll around the Grounds bound for their honeymoon. The destination of the Royal Couple's honeymoon remained a secret. The honeymoon will be for a traditional two week period and Prince William has a fortnight's leave from his job as an RAF search and rescue pilot in Anglesey. The pair are hoping for complete privacy after the public glare of their wedding. There is varying speculation that the couple may have gone to Scotland, the Caribbean, Jordon or Kenya. We're sure everyone will wish them a very happy time together and respect their wishes for privacy over the next couple of weeks.